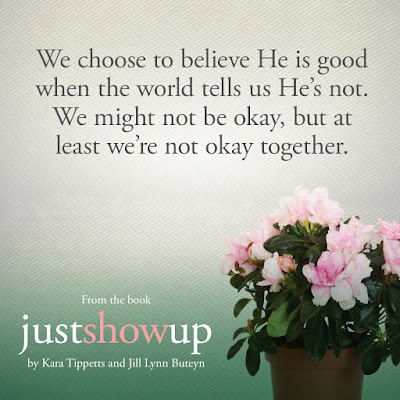 This summer I read and reviewed Just Show Up by Kara Tippetts and Jill Buteyn. I am thrilled to say that this book is now available in stores! If you are wondering how to show up for a friend who is suffering, this book will be a helpful resource for you. 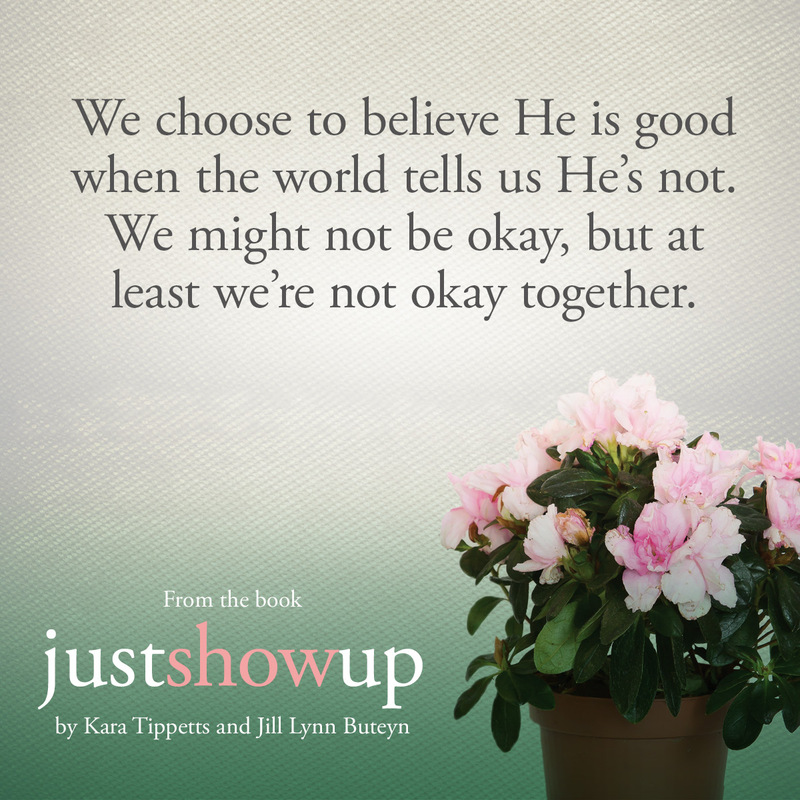 Today I would like to share Kara and Jill's own words about this book. For those of you who do not know, Kara passed away from cancer earlier this year. She is now in Heaven, so I will be sharing a quote of Kara's from the book. Jill and I dreamed and talked about writing a book together, one that would try to take the mystery out of walking with one another through suffering. That's the book you have in your hands. We would have liked to write a book that took the uncomfortable or awkward out, but there's no way we could do that and be honest. Because honestly, it's hard. But it's not difficult. You just have to show up. That's not some kind of secret figurative language. We're talking about literally showing up. Q: You wrote Just Show Up with your late friend Kara Tippetts. Can you tell us about Kara and the circumstances that led you to write this book together? Kara Tippetts was a grace-filled mother and pastor’s wife who was diagnosed with breast cancer at the age of 36. While fighting cancer, she shared her story with thousands of readers on her blog, Mundane Faithfulness. She also wrote the book The Hardest Peace about her journey and co-authored Just Show Up with me before passing away at the age of 38. While Kara was blogging, I was writing fiction. We often talked about collaborating on a book. We settled on the subject of walking through suffering together because we could write from both of our perspectives. I learned a lot from watching Kara’s community rally around her, from seeing her friends in action. Of course, as the one suffering, Kara had firsthand knowledge of what works well and what doesn’t. We both hoped the book would take some of the mystery out of showing up for each other and allow people to engage more confidently in community, even during really hard times. 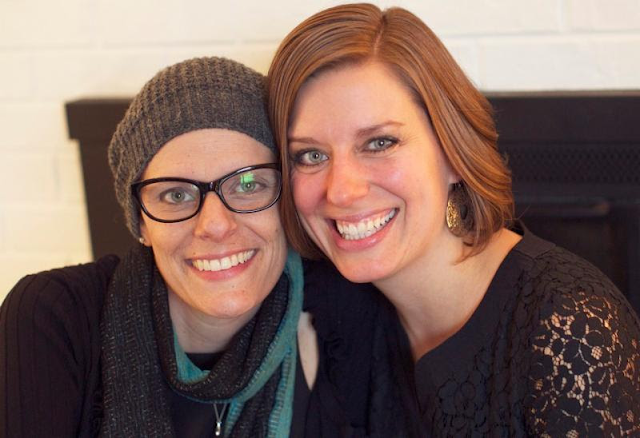 Q: How and when did you learn about Kara’s cancer diagnosis? Did it change your relationship with her? I actually heard about Kara’s diagnosis when she posted about it on her personal Facebook page. We were friends through school and church, but as I say in the book, our friendship developed more after her diagnosis. She had only been in Colorado for six months at the time. I do remember thinking about our friendship. Where did I fit in all of this? Was I “in”? I decided the answer was yes. I wasn’t going to shy away from Kara because things could get scary or hard. I told her later that choosing her was a conscious choice for me. Q: Do you think it’s easier to be someone’s friend when times are good? Certainly there’s a simplicity to friendship when things are good, but at the same time, when is “good”? We all have hard times, and we’re often dealing with tough stuff in different areas of life at the same time. But there’s also beauty that comes in doing the really hard stuff together. When I look back on my time with Kara, on the way she let me and so many others in when she was suffering so much, I see a lot of tears, prayers and pain, but I also see grace and even peace. I see really great friendships formed in a short amount of time. It was beautiful to walk with her, even though it hurt so much. It still hurts. But I would choose her all over again. Q: You write in Just Show Up that being there for a friend can be as simple as literally just showing up. Why is presence so important during suffering? Presence is so important in suffering because sometimes that’s really all we have to offer. We don’t have the right words, or there isn’t anything we can do to help. Sometimes it is just about being there. There’s peace and support in being with each other — from both sides. Often it was a comfort for us to be with Kara, even if she was sleeping, and I think she felt that same thing. One time I sat at the hospital with her while she slept. I brought my laptop and just wrote, sitting in the chair. I remember wanting to have something to do so she would feel free to sleep and rest. She opened her eyes and said something about how it gave her comfort that I was there. I could have easily second-guessed offering to sit with her — it wasn’t really necessary. But just being present with each other meant something to both of us. Q: Could you offer some advice for others on how to move past moments of awkwardness? Pray, then step out in faith. God will meet you there. Be honest. You could even say to a friend, “I want to help. I don’t want to be the person who disappears because this is awkward or uncomfortable. How can I be there for you? Will you help me by telling me if I’m doing something offensive or don’t have a clue?” I think friendships can grow from this kind of honesty. Q: When offering help to someone, why is it important to be very specific about how you would like to help them? It’s far easier for people to accept help when we offer something specific. I used to say to people, “Let me know if you need anything.” And I meant it. But rarely, if ever, did anyone ask me for anything or admit what might help them. However, when I offer a specific, “Hey, I’m at the store, can I pick anything up for you?” or, “I’d love to come by and do a couple loads of laundry this week. What day works?” it easier for the suffering people to decide if and when they need that specific help or how they can tweak it to meet their needs. The other bonus to offering a specific help is that it gives us the freedom to serve within our gifting. If I’m a kid person, and someone asks me to paint their guest room, that probably won’t bring me the same joy as watching kids. We can find so much joy in helping others, and I think part of that is in doing the things we’re gifted in — not that we don’t ever step beyond that. It’s just a good place to start. I love what I learned about being specific in helping others. It was a light-bulb moment for me. It just makes sense, and yet, I’d never really thought about it before. It’s important because it makes things easier and more comfortable for both sides and takes away the guess work. You can read more of the interview with Jill here. 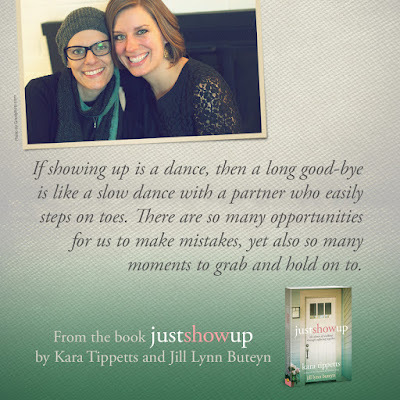 Thank you, Kara and Jill, for sharing your lives with us through your blogs and through your books. Thank you for showing us what it looks like to walk through suffering with a friend. You can connect with Jill on her blog, Facebook, and Twitter. You can read Kara's writing at Mundane Faithfulness and in her book, The Hardest Peace. And now for a giveaway! Would you like to read Kara and Jill's new book? 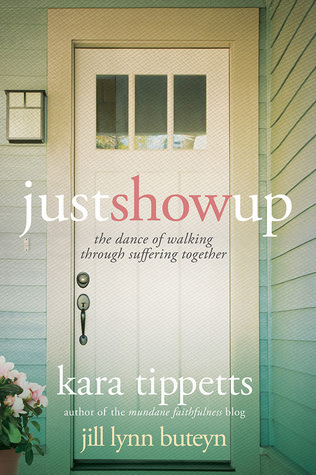 David C. Cook will be giving a copy of Just Show Up to one of you! You may enter using the Rafflecopter form below. The winner will be notified by email on Tuesday, October 27.